The Oakland Zoo’s environmentally friendly veterinary hospital has earned the second-highest level of LEED certification from the U.S. Green Building Council. The 17,000-square-foot hospital joined the Oregon Zoo Veterinary Medical Center in Portland as the only two West Coast veterinary facilities to hold Gold status ― one step below Platinum. LEED stands for Leadership in Energy and Environmental Design, a program that recognizes the design, construction and operation of “green” buildings. The goal is to reduce the use of energy and water. 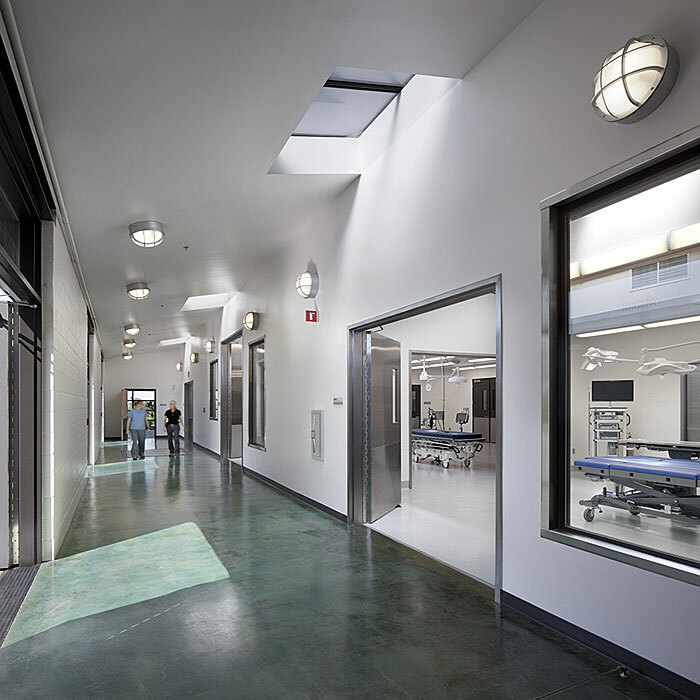 Natural light helps reduce energy costs at the Oakland Zoo Veterinary Hospital. • Maximum use of natural light in occupied areas to lower the need for electric lights. • Installation of sustainable icynene castor oil insulation. • Use of “cool roof” materials to reflect heat. • Installation of solar panels to provide more than 60 percent of the building’s power. • Use of sustainably harvested Forest Stewardship Council-certified wood. • Use of in-slab radiant heating. • Installation of outdoor concrete masonry pavers that reduce water runoff by allowing water to penetrate the ground. The rooftop solar power system has generated more than 100,000 kilowatt hours of energy since February 2013. That is enough electricity to supply 14 average-size California homes for one year, according to the U.S. Energy Information Administration. The contractors on the hospital project included Noll & Tam Architects, Swinerton Management & Consulting, Solar Technologies and Alten Construction. SunPower Corp. donated 154 solar panels. The new veterinary hospital replaced a 1,200-square-foot clinic. The facility includes small and large animal exam and surgery rooms, a radiology suite, a diagnostic lab, digital radiographic imaging and an animal care wing housing an indoor pool, climate-controlled rooms and a quarantine area. Some of the nation’s other LEED veterinary facilities include Eagle Veterinary Hospital in Olmos Park, Texas, which holds Platinum certification, and the Small Animal Hospital at the University of Florida College of Veterinary Medicine, which earned Gold status.